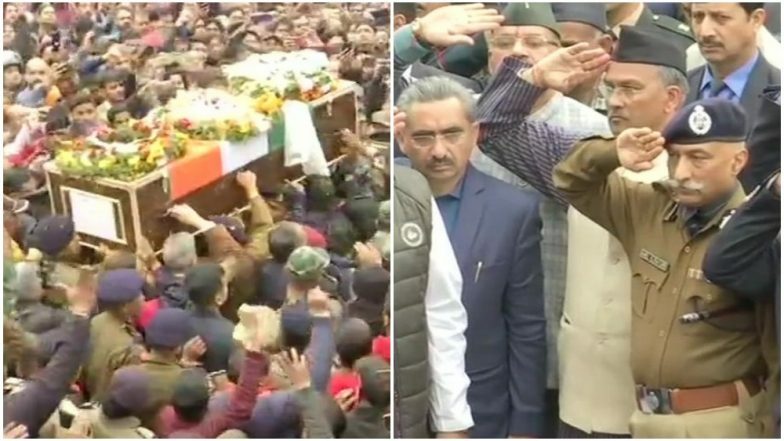 Dehradun, February 18: People gathered in large numbers in Dehradun to pay the last respects to Major Chitresh Singh Bisht, who lost this life while defusing a landmine along the LoC in Jammu and Kashmir's Nowshera sector earlier this week. Slogans of 'Amar Rahe' raised as people pay last respects to the braveheart. Chief Minister of Uttarakhand, Trivendra Singh Rawat also paid his last tribute to the Army Major. Bisht, 31, who was to get married on March 7 this year, lost his life on February 16 while defusing an IED mine planted by terrorists across the LoC in Rajouri's Naushera sector. Bisht was leading a bomb disposal squad team for sanitisation when mines were detected on the track in Nausher, a defence spokesman informed. He added saying that the team defused one of the mines successfully but while neutralising another mine, the device got activated and Bisht suffered grievous injuries and attained martyrdom. The mortal remains of the Army Major were brought to the Jollygrant airport in Dehradun in an army aircraft. It was then taken to the military hospital in Dehradun where it was kept till Monday, when the last rites will be performed. According to reports, Bisht's home at Nehru Colony which was eagerly awaiting his arrival as he was to reach home on February 28 as the marriage was slated for March 7. Hailing from Ranikhet in Almora district, Bisht's parents live in Dehradun. His father S S Bisht is a retired policeman and his mother is a homemaker.